The first place to start decluttering your home is in your drawers and closets. Sorting through your clothes to find what you actually wear and love can make a big difference and will make getting dressed in the morning easier! 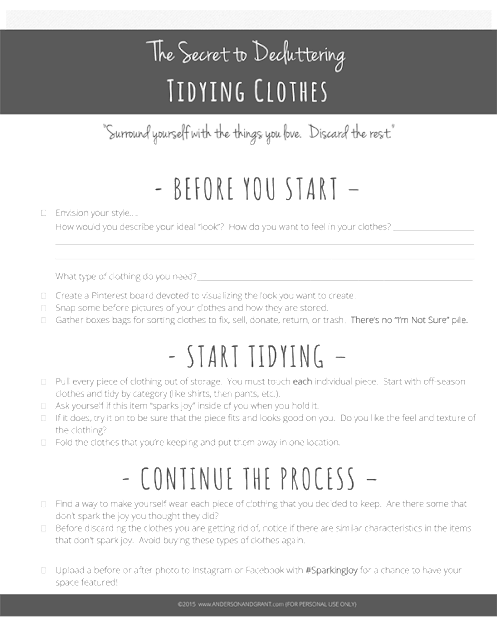 Read on to learn the tips to decluttering your wardrobe once and for all. There are probably very few of us who don't have more clothes than we could ever possibly wear. It is said that we all wear just 20% of our clothes, 80% of the time and I completely believe that is true. Clothes are the easiest things to replace, yet seem to be one of the hardest to part with. "I might wear it (or fit into it) again someday." "I spent a lot of money on it." "I liked it at one time." "It looked good in the store." "I wore it yesterday." But did you like it? "I don't want to just give my clothes away." "It is still in style (or will be again.)" As Marie Kondo points out in the book, The Life-Changing Magic of Tidying Up , sometimes a piece of clothing serves it's purpose without you ever wearing it. Some things will come into your wardrobe strictly to show you what you shouldn't have bought. Acknowledge that and then set the clothing aside to be donated, sold, or returned. The truth is having fewer clothes, the ones you actually wear and love, will make it easier to get ready in the morning, allow you to dress more stylishly, and give you more confidence. Imagine opening up your drawers and closet and not knowing what to wear simply because everything you see is something that you love. Sound like something you might like? So, you ask, where do we begin? Last week's post on getting started had you think about the vision you have for your space and your life that would guide you through the whole decluttering process. Before starting to tidy your clothes, you also need to have a specific vision for your style. How would you describe your "look?" How do you want to feel in your clothes? What types of clothes do you need? Mainly casual, dressy work clothes, or a mix of both? What would you like people to say about you and your style? Just as with turning to Pinterest to help see what you want your decluttered space to feel like, I love to turn to the platform when trying to come up with a visual idea for my style. There are so many inspiring pictures of great outfits. Save a bunch of images that you love and then see if you notice a trend in the clothing. Neutrals? Lots of color? Layers? Simple clothes but fabulous shoes? Recognizing what you like will help you to know what to keep, what to discard, and what to buy in the future. Once you've gotten a good idea of the style you're going for, you can move onto the next step. Through this exercise, you are choosing just what you want to keep, not looking for things to get rid of. You want to find the items you'll allow to stay in your life and what will make you happy. Snap some before pictures of the condition of your clothing storage. Open your drawers and closets. I always love being able to look back and see that my decluttering made a difference. You'll need to have a few separate boxes or bags. Donate, Sell, Repair, Return, Keep (these items will go back into your dresser or closet.) There is no "I'm not sure" pile. Although the KonMari method outlined in the book says you should pull all of your clothes out into one place at one time to sort through them, it isn't realistic for most of us to have that many clothes sitting around in the way until everything is looked through. So I broke the rules a bit and left them hanging in my closet and folded in my drawers and took one space at a time. You'll also want to pull all of your clothes out of storage that may not be in the bedroom or stored with your other clothes. I actually found a storage box of clothes under my bed that I had save the last time I cleaned "to go through in the future." Well, the future came and all but one item in the box was placed in the donate pile. And that item was a pair of black pants that I had made a note of as something I needed to buy to replace the ones I was getting rid of. Money saved. The key is that every item must eventually come out of storage, even if it isn't at one time. You must actually hold each piece of clothing in your hands. Start with off-season clothing first. It is harder to effectively judge if something makes you happy if it was something you wore recently. Tidying should be done in categories (such as all shirts, then all pants). According to Marie, you should go through each piece of clothing, hold it, and see if it sparks joy inside of you. Sounds crazy, but it actually works. There were some pieces of clothing that gave me no feeling whatsoever. Off to the discard pile they went. What you are left with should be only the items that spark joy.....but honestly that is hard to do. Sometimes it is hard to decide, so I've taken the KonMari method a couple steps further. When you are holding an item that does spark joy, the next step is trying it on. Does it fit? Does it actually look good on you? There were a few pieces that were sparking joy for me, but once I tried them on I realized that they didn't fit well anymore. Discard pile. If it fits, take time to actually feel the clothing. Does it feel nice to you? Sometimes something will have a texture that you really don't like to wear. There are a few sweaters that I own that look good and fit, but they just don't feel right when I wear them. Those have to go too because you will either not wear them for that reason or you'll be uncomfortable when you do. Once you've determined that you do love your clothes, they fit, and you enjoy wearing them, notice if those pieces fit into your style vision. You should be left with the clothes that you truly treasure and will make you happy and confident to wear them. 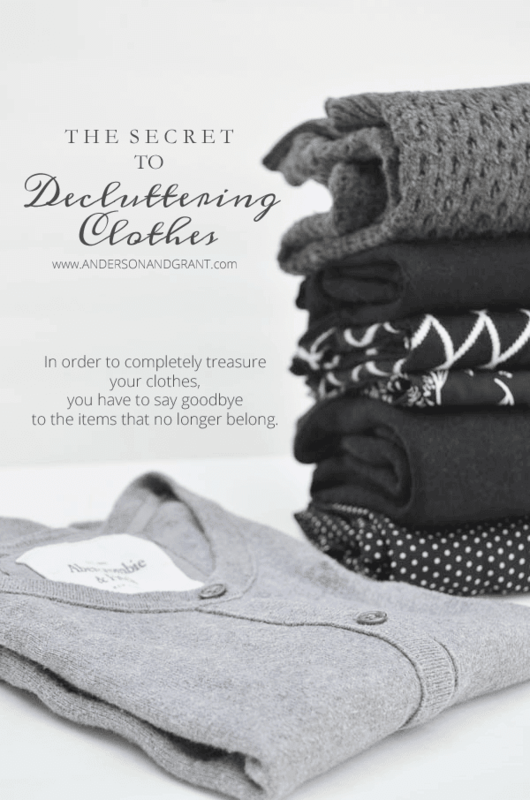 In order to completely treasure your clothes, you have to say goodbye to the items that no longer belong. The clothes that remain should fit into your style vision for now....not a vision that you had for yourself when you bought it or what you wish you could be. Take time to notice what is in the discard piles. Is there a theme to what you are getting rid of? Why did you buy each item if now it doesn't spark joy inside you? You may want to make a note of what you find to refer to the next time you go shopping. Also, before buying anything new, take a look at the picture you snapped before you began decluttering. Where will this new item go? Does it fit in with what you already have or is it going to wind up cluttering up your closet again? I'm not asking this to discourage you from buying anything. I just want you to be more intentional and think more before you buy. There are always going to be things that speak to you in the store, but you can now equip yourself with the knowledge needed to appreciate the piece and walk away without purchasing it if it is going to end up being unused later on. 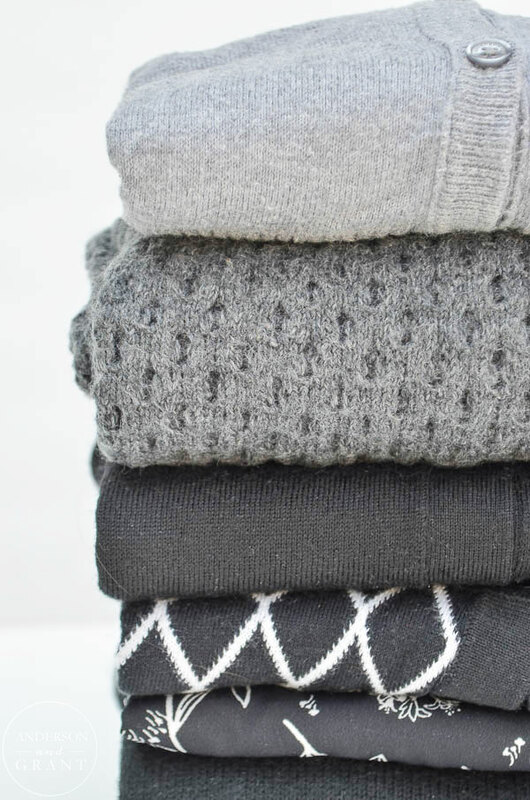 You should now have a pile of keep clothes ready to be put away. But the process is not done quite yet, and won't be for some time. The true test as to whether or not each piece of clothing really does spark joy is whether or not you'll actually wear it. After putting all of my keep clothes away, I could feel that there were still pieces that didn't belong. It felt like the job wasn't yet complete. To solve this problem, I have been forcing myself to actually wear each and everything I kept. This can be done in different ways, I'm sure. There were actually a few shirts that once forced to wear them, I realized that they didn't actually spark the joy I thought they did and I didn't even bother wearing them. A few others made it through the day but not back into my closet after being washed. I really do feel now like I am getting down to only the clothes that spark joy. And can I also say, that doing all this may lead you to find that there are some really fantastic pieces that you love and haven't been wearing? I found a shirt and a dress that I completely love now, but haven't been wearing either of them in the past few years until I forced myself. This to me is a sign that the old rule of getting rid of anything you haven't worn in a year doesn't work. These two items would have been gone but instead they are two of my favorites that I now will wear. You've got to be honest with yourself through this process. You shouldn't have to talk yourself into keeping something. Does what you are holding in your hands fit in with the style vision you created? Would you buy it again? 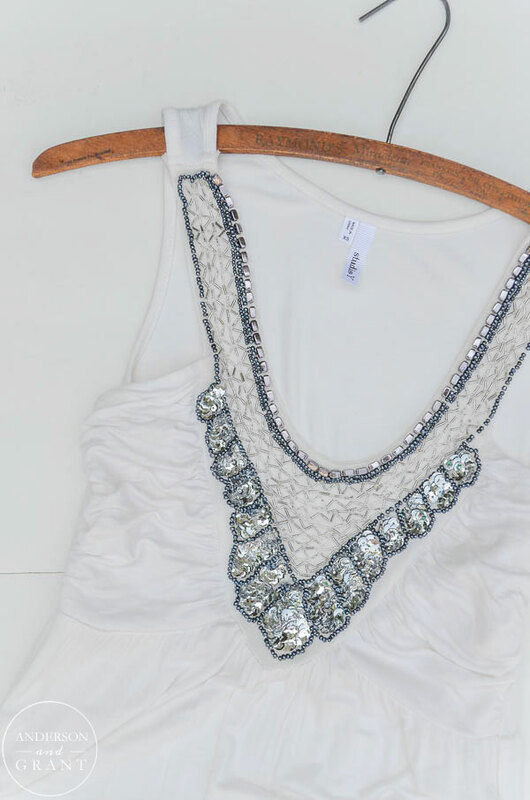 What will you wear it with? When did you last wear it? Why haven't you worn it since? Is it ripped or stained? Fix it. Button buttons. Zip zippers. Take care of those clothes that you find spark joy. This is easier when you have less. 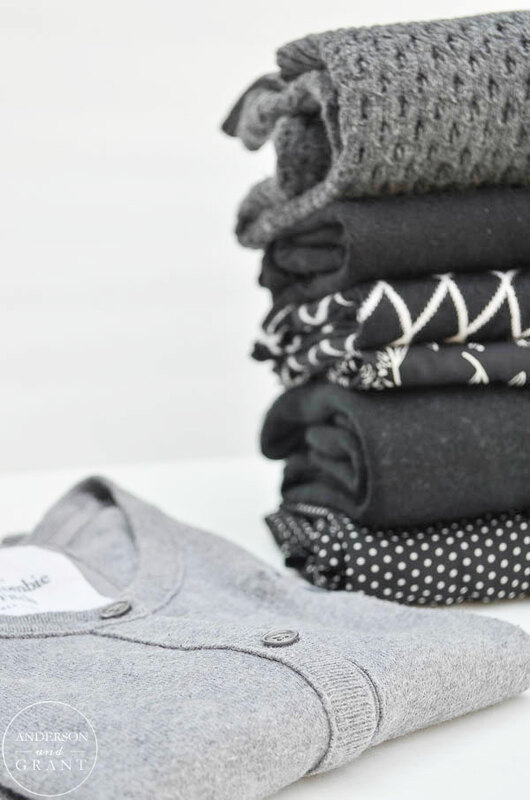 Marie has a very specific way of folding clothes that really does maximize your space and keep things neat and tidy. I honestly have folded shirts, pajamas, socks, and underwear like this for years without her instructions. I will touch on folding and organizing clothes (and all of you other belongings) more after we have successfully decluttered. For now, check out this website that has some great tips and videos on how to fold different types of clothing. Describe your vision. What style are you? 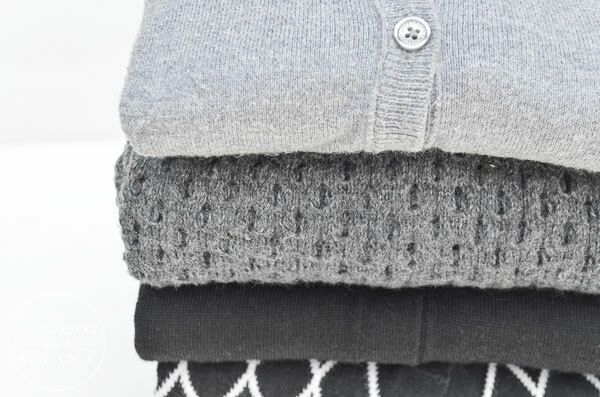 Sort through your clothing piece by piece starting with your off-season items. First ask if the item "sparks joy". If it does, try it on to be sure that it fits. Do you like the way it feels? Does the piece of clothing give you confidence and fit into the style you envisioned? Begin forcing yourself to wear each individual piece of clothing to really discover the pieces that truly make you happy. Discard the clothes that you don't want to wear or don't like. Donate, return, or sell the clothes that are still in good condition. Trash the pieces that are no longer or any use. 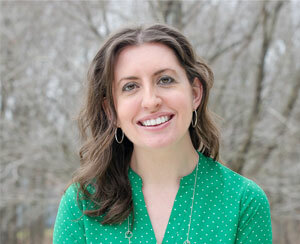 Take a look at the before photo that you snapped. See a difference? How does that make you feel? Take an after shot to compare later. Next week we will all be back sharing our decluttering journey focused on accessories (like shoes, purses, and jewelry) and beauty products. Good luck as you being decluttering your clothing. Enjoy the process! I would love to know your thoughts about the posts so far, even if you aren't willing to share any pictures.